Juan Esteban Varela » Please: do not think of a black cat. Of course. It’s that easy! Juan Esteban enters your mind and amazes you. He just needs the word and some everyday object, nothing else. The fact is that his magic lies, above all, within himself. As Juan Tamariz, his master (and that of the generations from the last quarter of the century and all the XXI century), says: “before the magician there is the artist and before the artist, the person”. 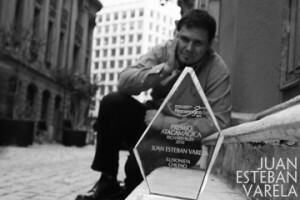 Juan Esteban shines for his intelligence, sensitivity and humbleness and thus, his magic shines for the same reasons. There is no need, even that is mandatory, to mention some biographic facts about Juan Esteban’s career. He was a magician since the age of 6, professional since 20, respected by the most well known personalities within illusionism worldwide, regular participant of Jornadas de el Escorial, in Spain, performer of the famous Magic Castle in Hollywood, USA. Living force and main reference of magic in Chile, his own country. “If we are truly unique – as Juan Esteban says in one of his articles” – the content of our expression should be unrepeatable as well. This, which is so evident to any art within magic, seems to be sometimes missed. Exaggerating a little – he concludes -: if an invisible hand would take a magician out in the middle of his act and change him, the audience would rarely realize it”. With Juan Esteban, this does not happen. Does someone who has developed Magic for the Blind and Magic without Elements, seem to you like someone easy to be replaced? Juan Esteban is one of those artists who search and inquire in order to reach a better way to express, so people can live an experience and not just a “magic show”. In a few words, he works, studies and thinks, so when you see him acting, it will not be the same to you to see somebody else. Someone will come (possibly he himself, given his charisma and kindness), and will tell you “please, don’t think of Juan Esteban”, and you will think of him, or even better, you will want to.